A native of Brooklyn, New York, Tony Falanga received his musical education at the Manhattan and Juilliard Schools of Music, where his principal mentor was the world-renowned David Walter, and at Boston's Berklee College of Music, where he received a degree in Jazz Performance. While at the Juilliard School he was awarded the prestigious Lewine Foundation Scholarship. 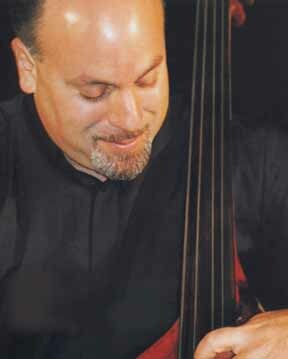 His extensive professional activities as a solo, chamber and jazz bassist have earned him critical acclaim as a player of "extraordinary excellence". In the classical repertoire he has appeared as soloist with the New York Concertino, the Tchaikovsky Chamber Orchestra, the Spoleto Music Festival, the Newport Music Festival and the International Society of Double Bassists, while as a jazz musician he has played with leading artists such as Wynton Marsalis, Andre Previn, Jim Hall, Junior Mance, Joe Lavano, Randy Brecker and Bob Mintzer. He is also in frequent demand by New York orchestras and ballet companies. Recent years have seen extensive collaboration with Klezmer phenomenon Giora Feidman, with whose ensemble he has concertized throughout Europe, and with virtuoso bassist John Feeney, as half of the Feeney/Falanga Duo, setting new standards for double bass performance and providing ample display of Falanga's natural talents as a creative, innovative and spiritual musician. God blesses people in many different ways. One of the ways in which I have been blessed is with David Walter. Dance of Joy was premiered at David's 89th Birthday party and should be played as an improvisation. The performer may extend, shorten or embellish any of the themes freely.